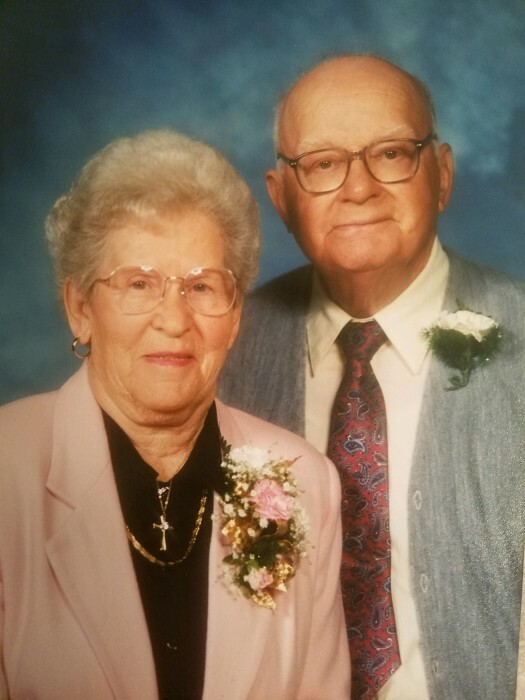 Dorothy Estelle Miller, age 96, of Millersburg, Ohio was reunited with her husband, Sunday, August 19, 2018 after passing away peacefully in her sleep. Funeral services will be 11 a.m. Monday at Alexander Funeral Home, Millersburg, Ohio with Pastor Kenneth Smailes officiating. Burial will take place in Killbuck Cemetery, Killbuck, Ohio. Friends may call from 5 to 8 p.m. Sunday at the funeral home. Those wishing to share a memory or make online condolences may do so by www.alexanderfhinc.com. In lieu of flowers, the family suggests Memorial contributions be made to the Killbuck United Methodist Church, 180 Mark Ave., Killbuck, Ohio 44637. Dorothy was born December 12, 1921 in Tippecanoe, Ohio and was the daughter of Harold Dean and Bernice (Clark) Poulson. Dorothy was a graduate of Uhrichsville High School. After graduation she worked for the Timken company in Canton where she met her husband, Arden Miller. They were united in marriage on May 20, 1950. Dorothy and her husband moved to Killbuck where they owned and operated Miller's Drug Store. She worked alongside her husband 35 years until retirement in 1985. Dorothy and her family enjoyed time spent in their Lake House at Buckhorn and winters spent at their home in North Fort Myers, Florida. Dorothy was a member of the Killbuck United Methodist Church, where she served on several committees. She was also a member of the Killbuck Valley Garden Club, the Killbuck Lions Club, and was founder and member of the Briar Hill Bridge Club. She enjoyed bowling and was an avid golfer, which kept her young. Dorothy loved to play games and was an accomplished Knitter, teaching anyone that wanted to learn. She was loved dearly and will be greatly missed by her daughter, Dee Miller of Columbus, Ohio; son, Dan (Jennifer) Miller of Millersburg, Ohio; grandchildren, Carrie (Chad) Williams of Croton, Ohio, Cassie (Justin) Kibler of Croton, Ohio, Caleb Cooperrider of Croton, Ohio, Zac Cooperrider of Columbus, Ohio, Aaron Miller (Laken Walraven) of Millersburg, Ohio, Reed Miller of Bend, Oregon, Corin Crilow of Columbus, Ohio, Caleb Crilow of Millersburg, Ohio and Collin Crilow of Millersburg, Ohio; great-grandchildren, Cooper, Ava and McKenzie Kibler, and Owen and Ila Williams; two sisters, Janet (Dale) Mallarnee of Deersville, Ohio and Carole Hyllier (Al Kennedy) of Dover, Ohio; and 20 nieces and nephews. She was preceded in death by her husband, Arden on September 11, 2011; her parents; and siblings, Mary (Harold) Baum, Helen (Harry) Heavelin, Robert (Lois) Poulson and John (Dorothy) Poulson.